They weren’t sure what they wanted to do with it when they got it – Ally fleetingly thought she could put it on a leash, and Carter briefly imagined training it to be a hat in the winter. For the moment however, they were caught up in the glee of a chase. They followed the little furry thing into a backyard, and when it went under a fence, they went over. They were single-minded and completely focused as they chased it through two more yards, and when the furry thing bolted through a hole they weren’t expecting, they both ran right into a tree that clinked and rang in answer. Both children looked up to see dark blue bottles hanging down towards them. As they got up and brushed themselves off they realized that each of the four trees in this particular backyard had blue bottles hanging from the branches, each filled with a different amount of liquid. Carter started to wonder what the liquid in the bottles was for, but a perfect Summer breeze interrupted his wondering and played a beautiful sonata on the bottles, like an eerie, playerless organ. Both children had chills up their spines and goosebumps on their forearms, which was compounded by the un-oiled squeal of the screen door to the house opening. A frail, hunched woman appeared from the semi-darkness. “Well hello, you two. What are you doing here?” Her voice sounded like crunching leaves in Autumn. “Why do you have all these bottles tied to trees?” Ally countered. Answering questions with questions was a great way to stall being in trouble. “To make that beautiful music,” she said. “Did you make this?” Carter asked. The old woman beckoned them inside her house while she nodded. Ally and Carter had a brief eyebrow conversation and decided that they would go into the house, but only for a little while, and only because it was so hot. They walked to the door, began breathing their mouths in case the house smelled like old lady, and wiped their feet on her mat. “You young folk like pop?” The woman asked. 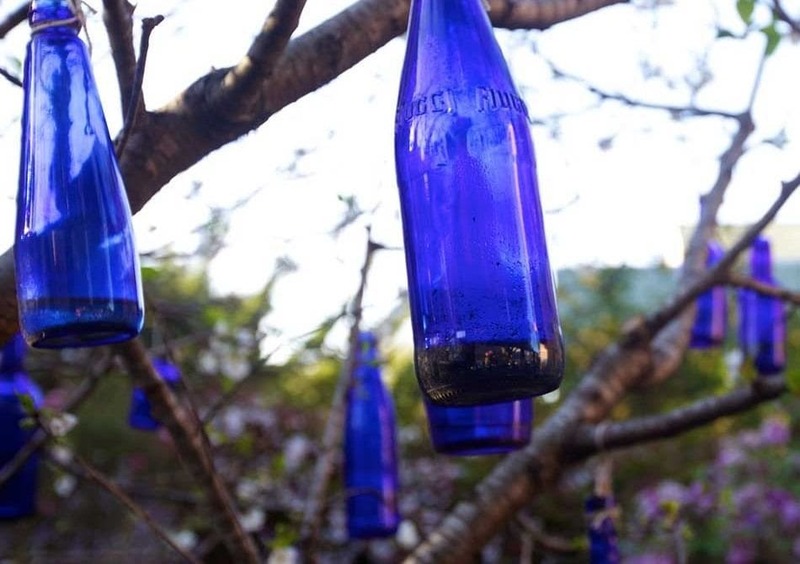 She went to her refrigerator and took out a couple of the same blue bottles that hung from her tree. She poured the two sodas into tall glasses and shoved the glasses into the children’s faces in such a way that they couldn’t refuse them. They sat down on a couch that threw up dust. Carter shifted uncomfortably. He was thirsty from Marmot chasing but he didn’t like the way the soda smelled and he knew he wasn’t supposed to drink things given to him by strangers. He pressed his forehead to the glass to feel the coolness, and Ally looked at him through the glass, which distorted her face. Carter laughed and then they both looked up at the woman. “What’s your name, Mrs.?” Carter asked. “Are they vicious?” Carter wondered. The kids shared an astonished look with one another, and Mrs. Meer prompted them to have a sip from their glasses by looking at the drinks and looking at them and smiling with ugly crooked teeth. “I’m not allowed to have soda unless it’s dinnertime, Mrs. Meer,” Ally said, sensing danger. “And I haveâ€¦ Die. Beet. Us.” Carter said, trying on a word his parents used. Ms. Meer looked at them hungrily, and the kids stood up to excuse themselves. “How did you get all those bottles out there?” Carter couldn’t stop asking questions, despite his growing fear of the woman. Both kids hadn’t rid themselves of the chill they got from the glass bottle symphony they heard earlier. “I have my secrets, you have yours,” Mrs. Meer said, attempting a smile again. Ally thought about many things after Mrs. Meer said that. She looked around the house, which had empty blue bottles on every surface, except for a strange portrait album that had pictures of children bursting its seams. She thought about kicking Mrs. Meer, and she thought about Carter, who kept almost reaching for the glass of soda in front of him, and then remembering at the last second that he was trying not to drink it. Then, Ally had a stroke of genius. She saw Mrs. Meer open her mouth in delight when Ally took the glass off the table, and then her eyes opened wide in surprise as Ally sloshed the carbonated liquid out of the glass and into Mrs. Meer’s mouth. Carter cheered and Mrs. Meer melted as a tone rang out over the two children, raising every bit of hair and skin on their body to spine-chilling attention. Mrs. Meer liquefied incredibly quickly and shot across the room, into an empty blue bottle, filling it nearly to the top. “Gross,” Carter said, wrinkling his nose. Ally took the bottle outside and tied it to the tree, then took another bottle down and tipped it over. The little bit of liquid became a surprised teenager. “We have a busy afternoon in front of us,” Ally said. Carter started to climb the tree to get more bottles. Posted on Wednesday July 21st, 2010 Wednesday March 26th, 2014 by Max Elman. This entry was posted in Photos & Stories and tagged blue, bottles. Bookmark the permalink.